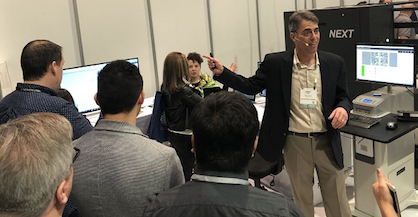 This week during the Sourcing at MAGIC tradeshow in Las Vegas, Electronics For Imaging, Inc. (Nasdaq:EFII) is showcasing its award-winning end-to-end solution for digital textile manufacturing – the EFI™ Mini Textile Factory. A unique offering for industrial textile digital printing, the Factory encompasses design, print preparation, printing, image fixation and cutting with an integrated set of solutions from EFI and partners. MAGIC attendees can witness how digital printing can revolutionize the apparel market with the EFI Optitex® 2D and 3D Design platform, the EFI Fiery® Textile Bundle, and EFI Reggiani inkjet printers. This digital workflow makes it easy to collaborate globally and reduces the cost of both sample making and the manufacture of small-lot apparel. It is already revolutionizing the fast fashion market by reducing the need to ship expensive samples around the globe. Over the longer term, it will also enable point-of-need manufacturing, opening new opportunities for brands and retailers alike while taking time and cost out of shipping. The Mini Textile Factory gives users the ability to do fast prototyping and production, but it also eliminates the need for large minimum orders and inventory, while reducing turn time to market. Apparel companies can produce their goods as you need them, when it’s ordered and purchased. Cutting Solutions: EFI and partner technologies automate the cutting process, thanks to its compatibility with almost any material to prepare fabrics for sewing. The products shown this week extend EFI’s global role in the analog-to-digital transformation of print manufacturing, including in the commercial print, ceramics, corrugated packaging and signage and display graphics industries. For more information about EFI industrial textile products and services, visit www.efi.com.